Plan your dogsledding trip today for a chance to see breathking Sierra scenery on a unique backcountry tour. Tours begin at Smoky Bear Flats just north of town. You can choose to head out for a few hours, or make it an overnight trip. Trips can be tailored to suit all ages and aptitudes. Take a one of a kind trip through Mammoth’s backcountry on a dogsledding tour. Tours can be tailored to fit all skill and comfort levels. Dog sledding is a wintertime activity, so as long as there’s a good snow base, the dogs can run. During the summer, visit the area kennels for a chance to meet the dogs. Tours begin north of Mammoth Lakes at Smoky Bear Flats and travel through the beautiful backcountry of the eastern Sierra’s. Choose to head out for a few hours, or you can plan an overnight camping trip. Sleds can fit anywhere from a family of four to three adults, depending on the weight of the party. Unless you come to town with your own sled team, you’ll need to hire an outfitter. 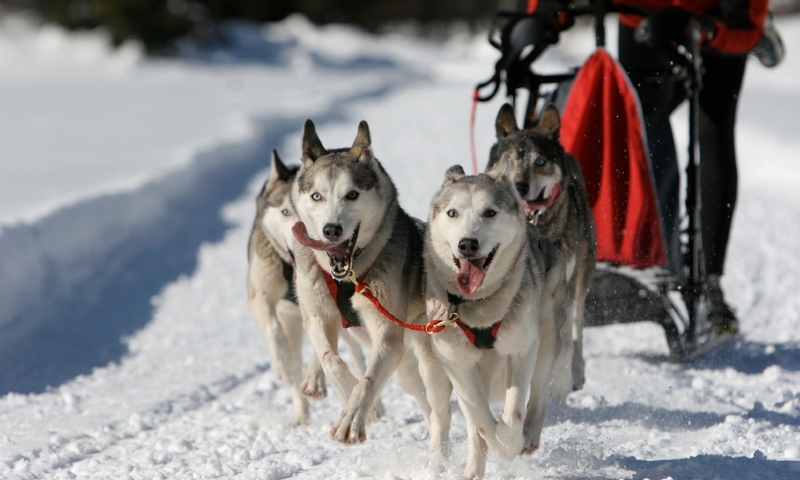 Explore the guides on this page to get started on planning your own dog sledding adventure. Rates begin at $90 per person for a 50 minutes trip. Overnight trips cost $600 per person.